Carryings On Up The Dale: Battleground 2015 and the 'Man of the Match Award' goes to Seydlitz playing away at Rossbach! Battleground 2015 and the 'Man of the Match Award' goes to Seydlitz playing away at Rossbach! Saturday saw us off to the Battleground show in Stockton. This is actually a really good medium-sized event with excellent lighting, parking and facilities in general (IMHO) except that the cafe is across the car park and it was bucketing down for much of the day! 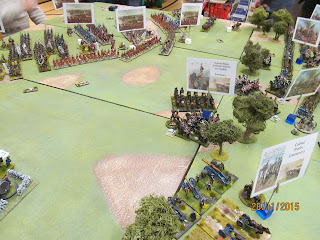 John and Neil were putting on a demo using gorgeous 10mm figures and the new Blucher rules, while Robbie and I refought the battle of Rossbach in 28mm. 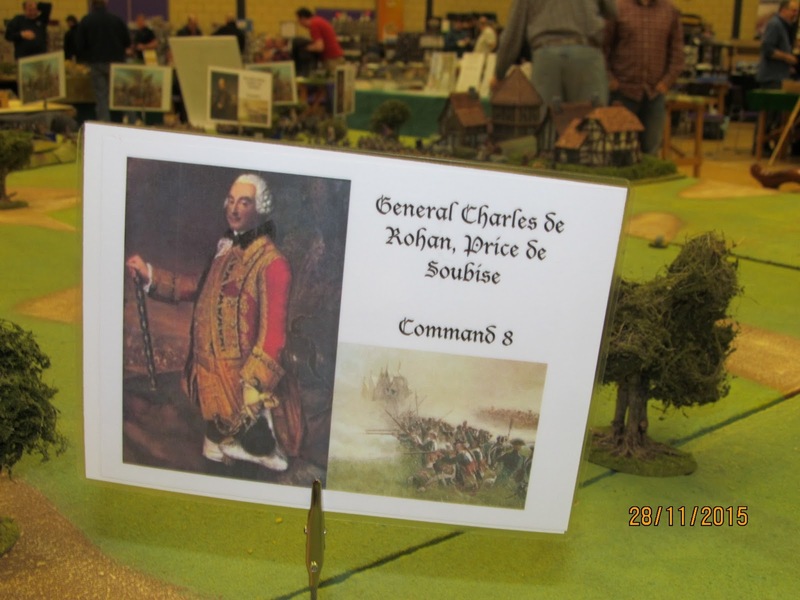 Actually, although we'd played this game earlier in the year, it was Robbie's idea and I was therefore sure he had worked out a master plan that would reverse the course of history and allow the Franco-Imperial army to win. Mmmm? To add to the visuals (or detract from them?) I'd prepared some cards for each of the commanders, showing their command level and any attributes, as well as in almost all cases a portrait of each individual on their card. (The real reason is that I recently found my laminator and had a spell when anything not moving was laminated!) The orders of battle were pretty much the same as for our earlier refight (see the earlier post on this blog for full details as I don't need to repeat them here), although I did add a couple more units of infantry and cavalry to both armies while still maintaining the appropriate ratio as in reality the French-Imperial army outnumbered the Prussian by almost 2:1, the odds being evened slightly by the detachment of Louden and St. Germaine to watch the Prussian camp and the small holding force left their by Frederick. 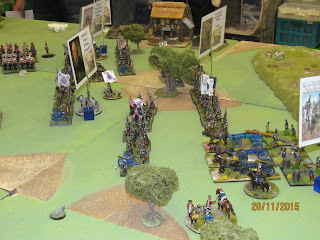 As usual we used Black Powder with suitable amendments to reflect the quality of the troops and leaders involved, i.e. the Prussian infantry at this stage were excellent; the French were 'average' and the Reichsarmee were pants. So, having had a quick scoot round the other games and check Graham from Cran Tara had my order ready to collect we set to it. 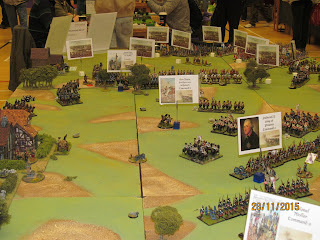 In the end I twisted John McC's arm into playing Frederick, while I 'umpired' and stuff, chipping in as (in)appropriate ( and helped with the Prussians). The French and Imperial infantry had been left behind by their cavalry and were well in the rear, and although placed on the table for convenience they wouldn't activate until turn 3. 12' is a long table. The Allied cavalry can be seen in the far distance, and it is just possible to make out the Prussian cavalry and artillery with the infantry lurking behind the Janus Hill. 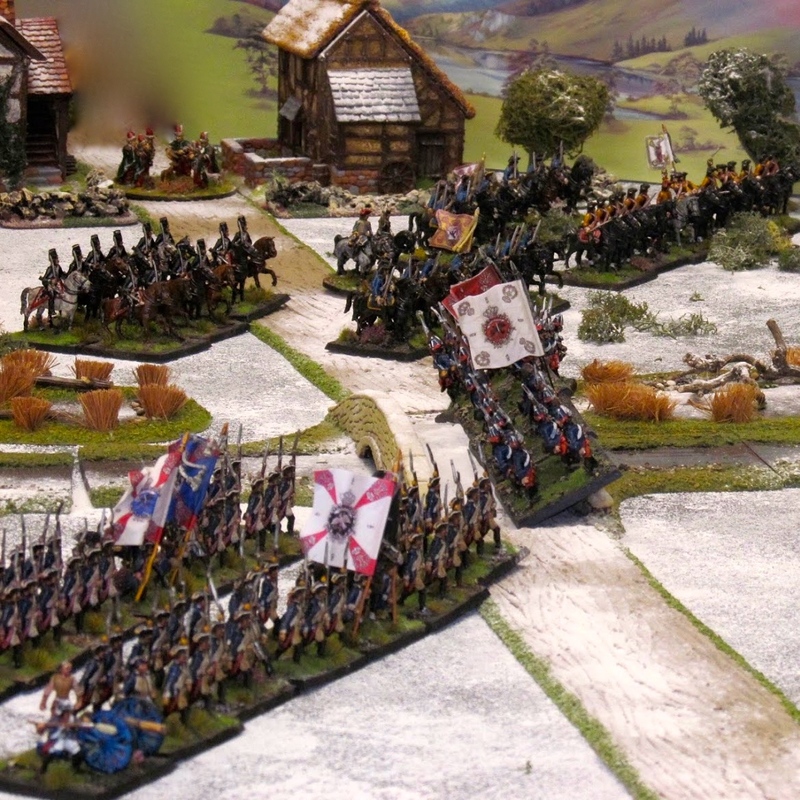 The Reichsarmee brigade on the march. 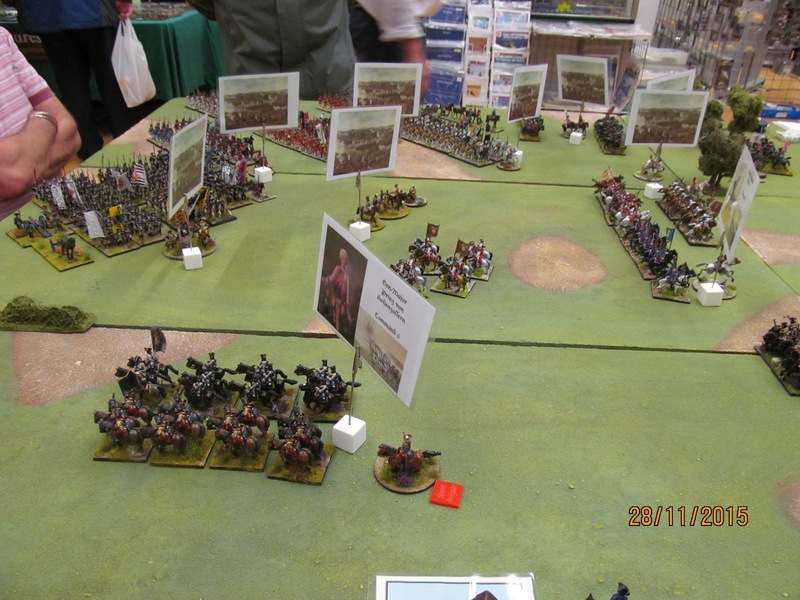 The Austrian/Imperial cavalry, well in advance of the French horse and even further ahead of the infantry. 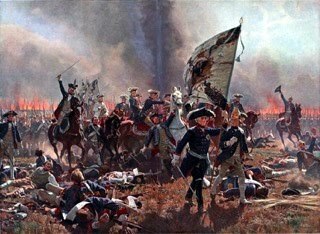 They were oblivious of the danger posed to them by the Prussian cavalry under von Seydlitz and remained in column of march. 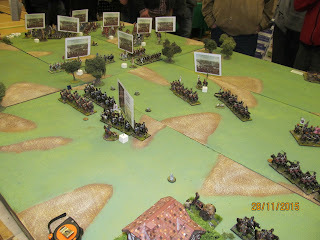 As seen from behind the Janus hill, the Austrian and Imperial horsemen left of centre about to be 'bounded' by Seydlitz's cavalry. The man himself, looking just like his picture. Frederick on the Janus Hill with the artillery of Colonel Moller. In turn one the Prussians under Seydlitz crashed into the heads of the enemy columns and drove two regiments back. 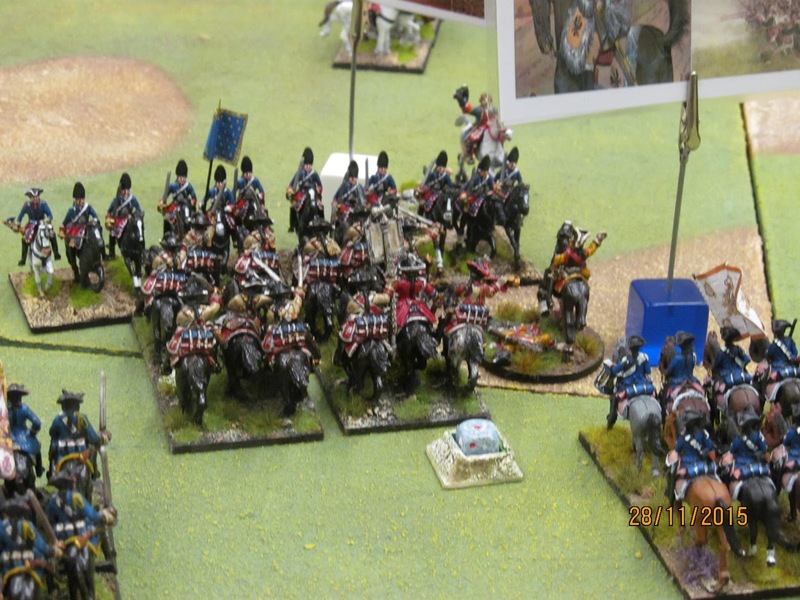 The two victorious Prussian regiments then carried out a sweeping advance onto the next two Austrian/Imperial cavalry which were also either broken or forced to retire. 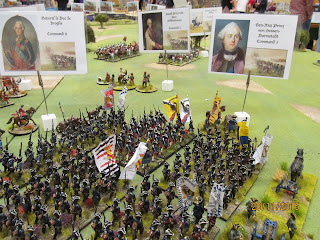 Only one of General Schonach's regiments was able to charge as he failed his second command roll, leaving Seydlitz momentarily unsupported. Robbie's master plan had been to extricate as much of his cavalry as possible and withdraw them out of harm's reach and give himself a greater before his infantry arrived. 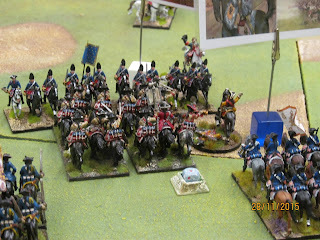 The master plan unfortunately didn't survive first contact with the enemy as the Prussian cuirassier and dragoons came sweeping on, either breaking or driving back the Austrian and Imperial horsemen. 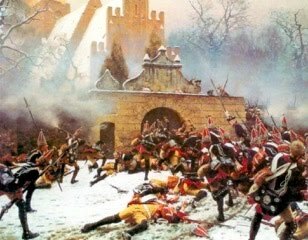 The Reichsarmee cavalry were historically pretty bad and in the game history wasn't changed! Only the Austrian regiments made much impact in trying to halt the tide of Prussian cavalry, but one of the Austro-Imperial brigades was completely shattered while the other lost two regiments while still managing to pull back. Casualties overall were heavy among the Allied cavalry. 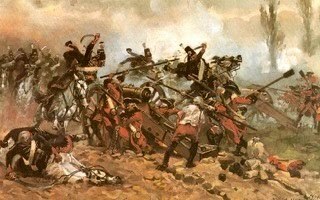 Prussian losses were insignificant at this stage with the exception of a dragoon regiment which bit off more than it could chew and fled the field broken after coming off worst in a melee with Austrian cuirassiers. 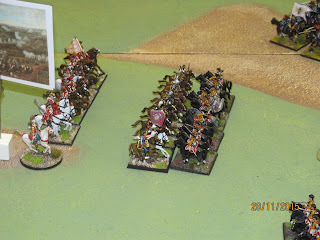 Robbie then threw in some of his last remaining cavalry, i.e. two regiments of French, but they were swiftly driven off by the Prinz von Preussen Cuirassiers. 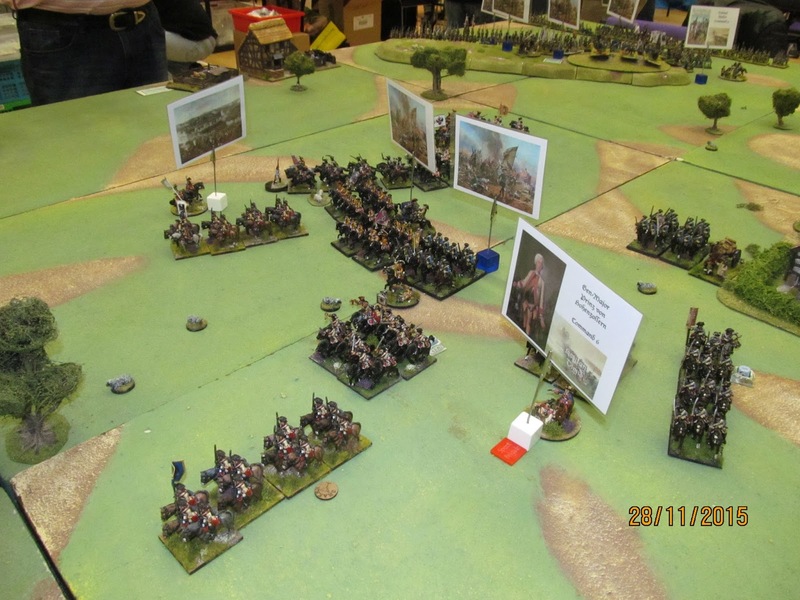 Robbie's Austrian hussars performed heroically on the day, fighting several rounds of melee with Prussian cuirassiers without being broken. 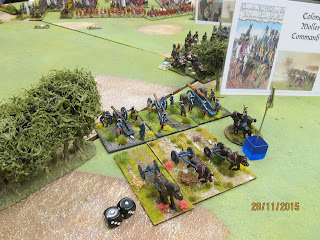 They were finally forced to withdraw behind their infantry to rally along with the remains of their brigade. 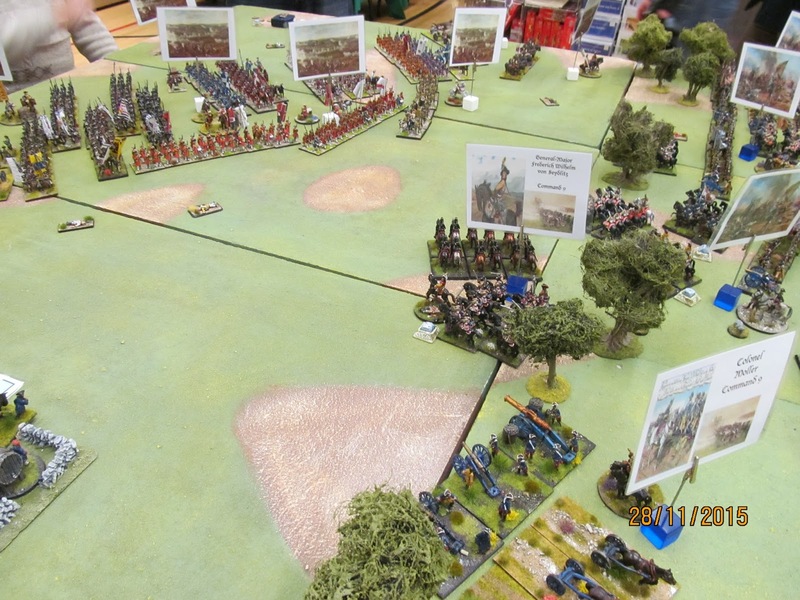 Turn three saw the Prussian infantry march rapidly over the Janus Hill and towards the Allied army. 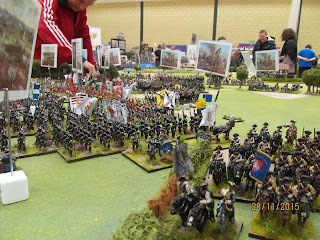 Actually, the brigades of Anhalt-Dessau and Henri of Prussia bounded forward while that of Forcade didn't get the order to move so annoyingly stayed where it was. 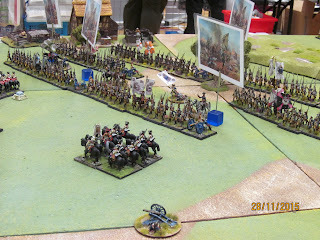 Frederick on his white horse advancing with his infantry. 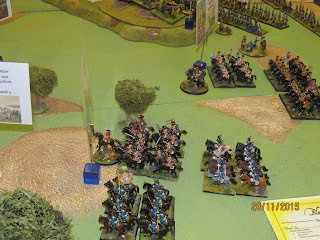 The Prussian artillery only got one shot off before the cavalry melee swept off into the distance so they were forced to limber up and find a better position closer to the action. 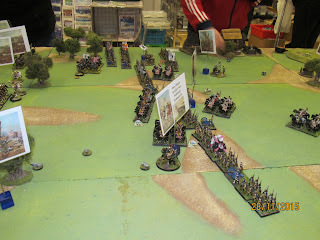 Looking down the table again from the Prussian end, the battle has swiftly moved away from their original positions. 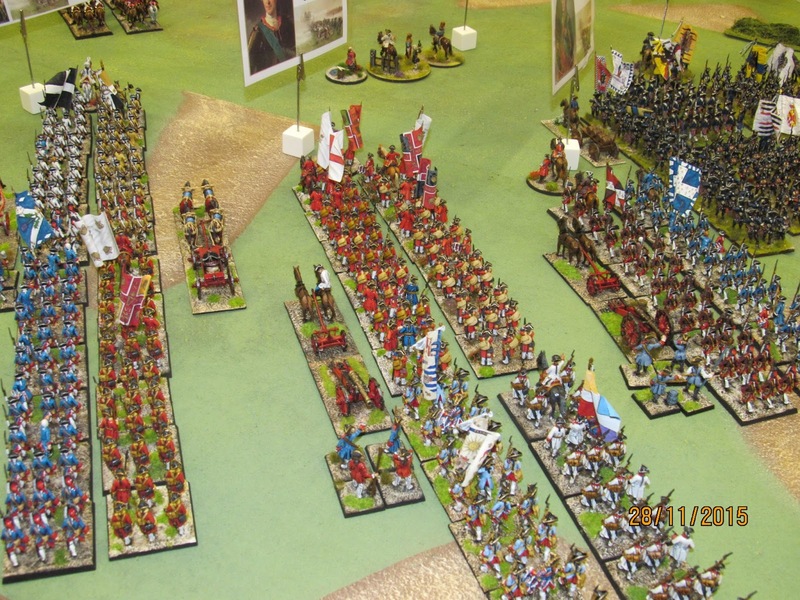 The Allied infantry has also made an appearance, and Robbie was desperately trying to get them into formation and out of march columns. 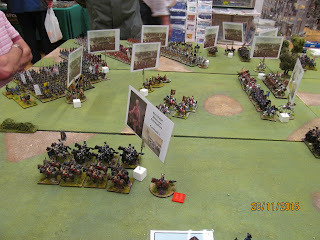 Fleeing Allied horsemen in the foreground while the last remaining Allied cavalry (to the right) prepare to meet the Prussians and attempt to delay them long enough for the infantry to deploy. 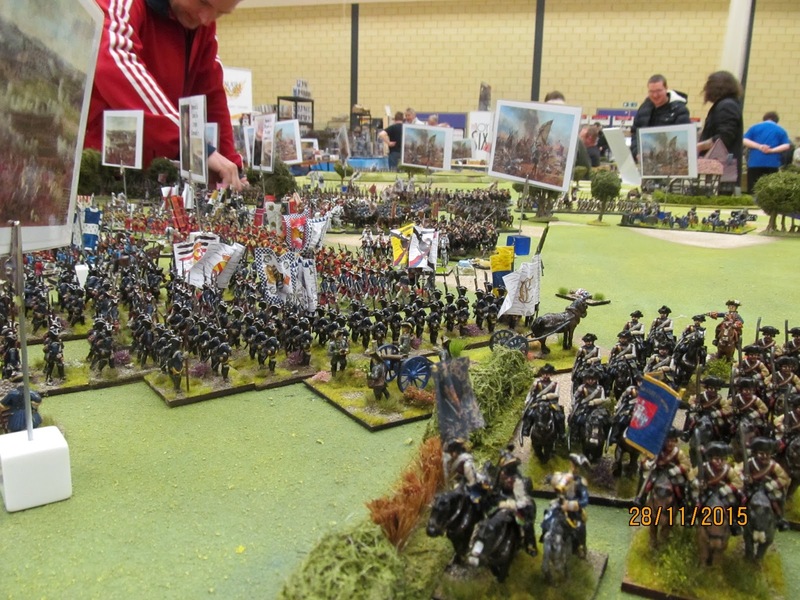 A note here: the Allied infantry had to remain in column of march until they came within 24" of the Prussians in order to reflect their sluggish response to the Prussian menace. 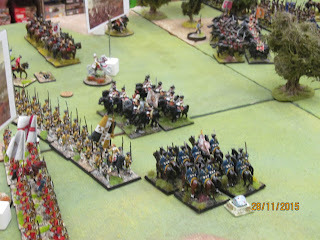 The Prussian infantry has now almost overtaken their cavalry. 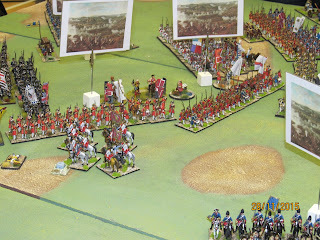 Robbie's infantry begins to deploy. Two Irish battalions (masquerading as Swiss for this game) shake out into line in the nick of time as the Prussian horse were well within charge reach had the infantry chosen to remain in column. 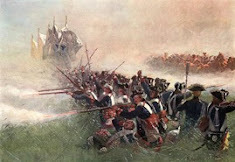 The Prussian Garde du Corps led by Seydlitz in combat with French cuirassiers, who they subsequently broke. 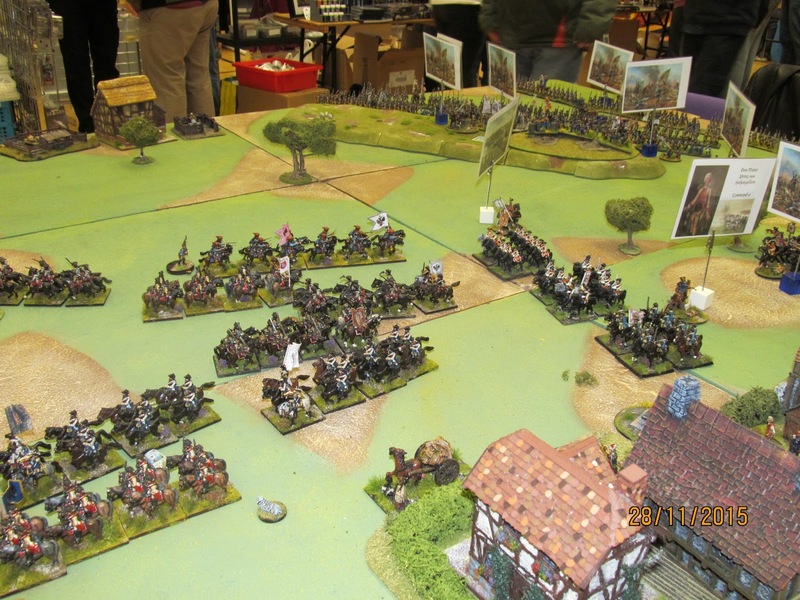 The Allied cavalry streams back shattered past the Reichsarmee infantry brigade, giving them a boost to their confidence......not! 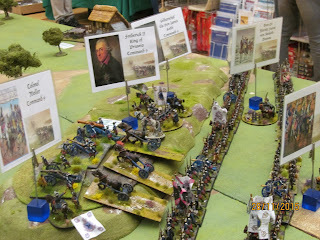 John managed to catch one French battalion after driving off the Austrian hussars which had been to their front. 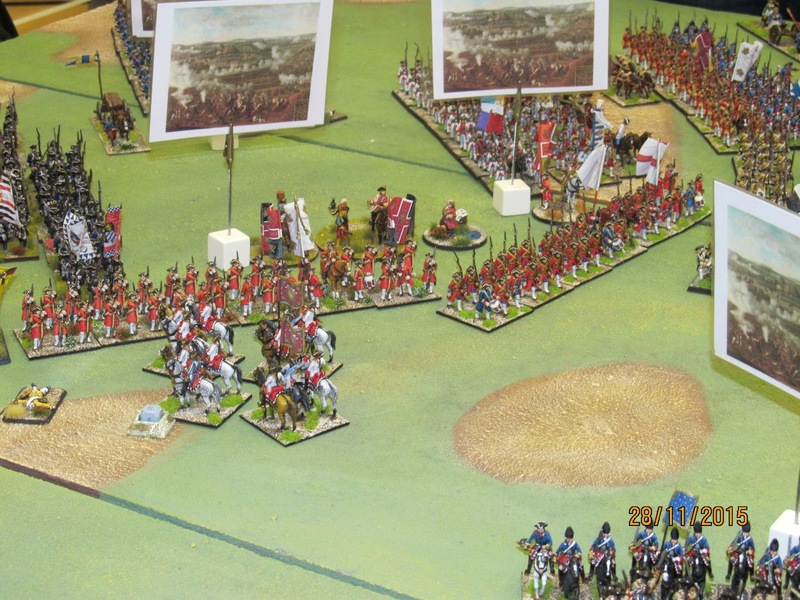 A French regiment was also on the infantry's flank but were destroyed by Prussian dragoons. The infantry broke, leaving their supporting battalion in a precarious position. However, at this point Robbie conceded defeat. Nothing had gone right for him, the speed of the Prussian advance kept him on the back foot and he threw some dreadful dice to boot. 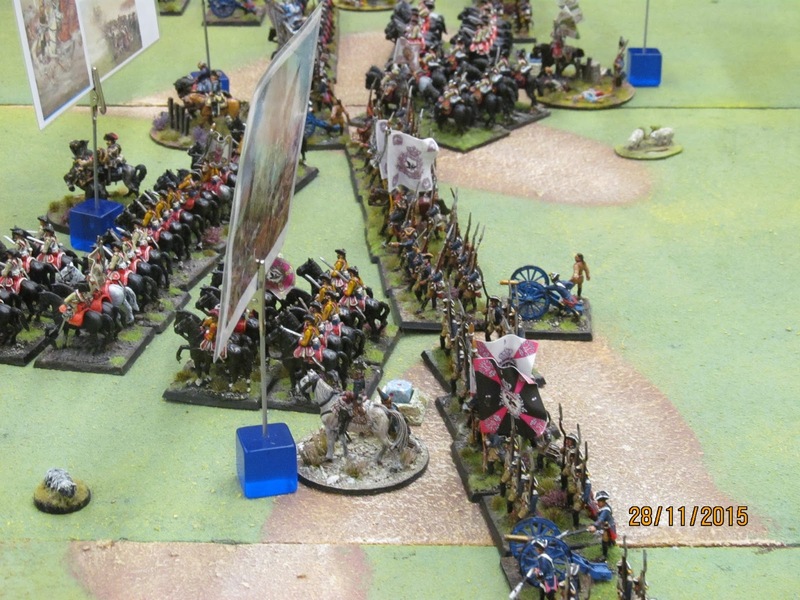 The Prussian artillery finally found a new position and unlimbered, just in time for the Allies to concede the game. General Forcade's brigade of Prussian infantry never got over the hill. Thankfully they weren't needed. 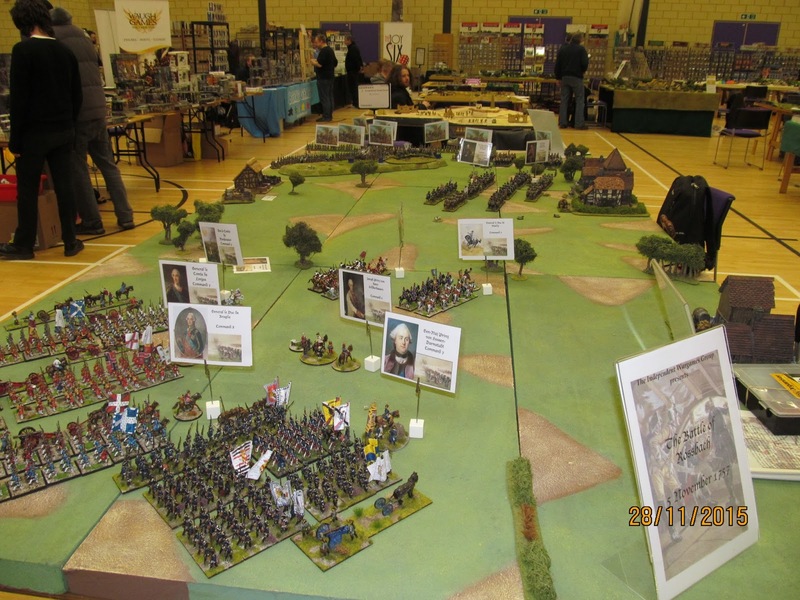 Well, I think it was a great game, very colourful and it attracted lots of interest and positive comments and I spent lots of time talking to people about the game and the pleasures of 18hC wargaming in 28mm. Its just a shame that the Allies didn't have the same good fortune that they had the first time we fought this game a few months ago but there you go. 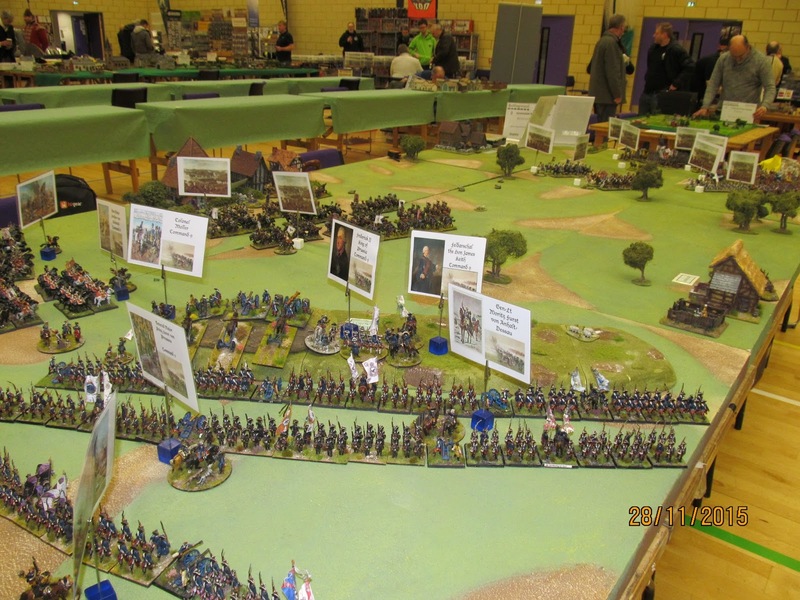 The Prussian infantry never even got into action! 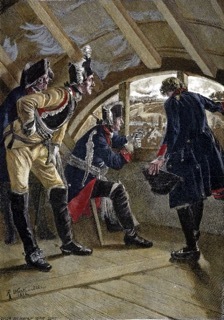 Seydlitz had almost single-handedly defeated the Franco-Imperial army. With all the latter's cavalry out of action it was never going to be a good day for the rest of the Allied army. Thanks to Robbie for the idea and for providing the terrain boards and the French, and to John McC for taking part in the game and helping out. 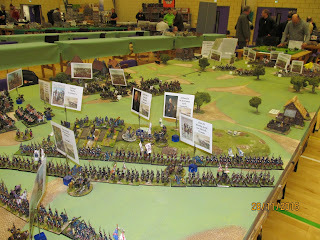 Also big thanks to John and Neil who helped my wife bring all my troops and terrain inside from the car. 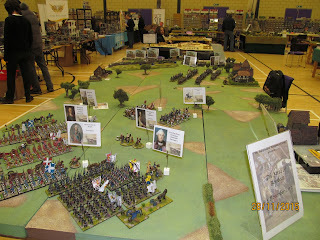 As for the show, it seemed be well attended and there was a good range of games on display, although not all of them were good. Many were though. Plenty of trade, but apart from my pre-order from Cran Tara and some paints I didn't buy anything. My wife, fresh with new hairdo and fed and watered by her mum, duly collected me at 3pm and we were all packed up and home by 5pm. All in all it was a good day out and hopefully Robbie won't be too bruised by the battering his army took. 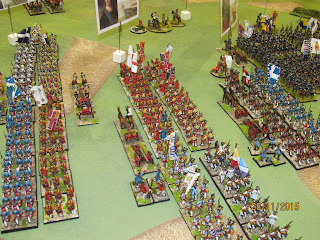 Next week we are planning to try out the new 'Honours of War' rules as a possible alternative to Black Powder. It was another cracking game that the pair of you put on yesterday. Certainly it was among the best on the day. Also, I probably should apologies that I didn't say hello to you when I introduced myself to Robbie, while you were both packing away. In truth I wasn't too sure who was who at your table. It was Stuart (Col. Bill) who pointed out which person was Robbie, so I could say hello. Splendid stuff, Colin. Looking forward to see how you get on with HofW, I have bought a set and hope to persuade Dave to give them a try too. They're probe worth a try - I am a die-hard BP player but always up for something different. Another fine report with high quality pictures Colin! Tell Phil I'll try HofW, but I'm not enthusiastic as most Osprey rules have left me underwhelmed. David, they LOOK ok, we shall see how they PLAY and will tell Phil how we do. 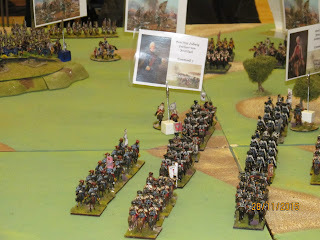 A good write up Colin and thanks for trusting us with the Prussians, given my track record of losing their high command in the last couple of battles !! 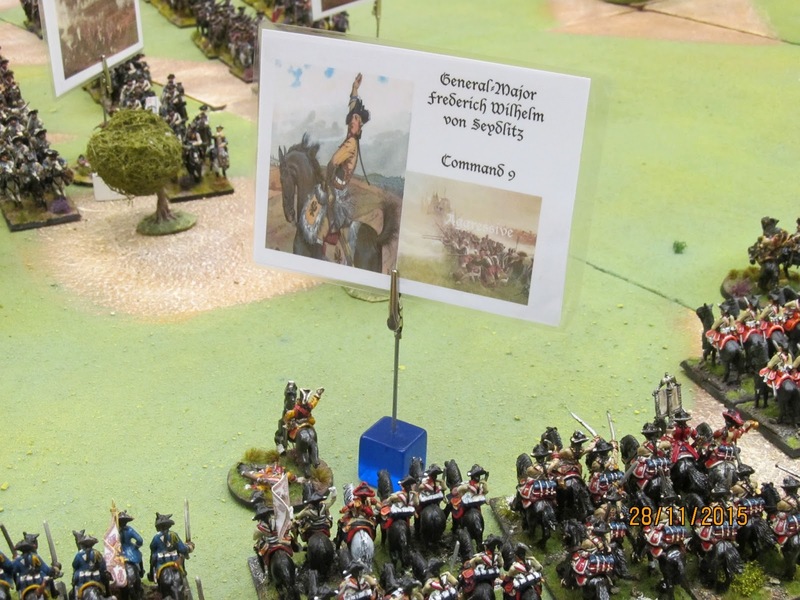 Seydlitz did us proud and the dice gods were kind, even the blunder for the cavalry lead to another succesful charge, if not necessarily what was intended!! It was a tall order for Robbie to extract himself from the (historical) opening position and he still probably did better than the original commander !! Thanks for coming to the show, it was a cracking looking game! A beautiful and fun game. Your table looks high but you managed to make good use of it all it seems!